No time to work out and build a gallery wall? No problem you can buy our gallery walls as one piece. This floral tribute to The Chelsea Flower Show starts at £400. It's eclectic mix of vintage pieces, typography and photography. The star of the show is the "Magnolia's" print by the fabulous photographer Nathalie Priem. Email us with the size of your wall and we can work out a bespoke quote for you. 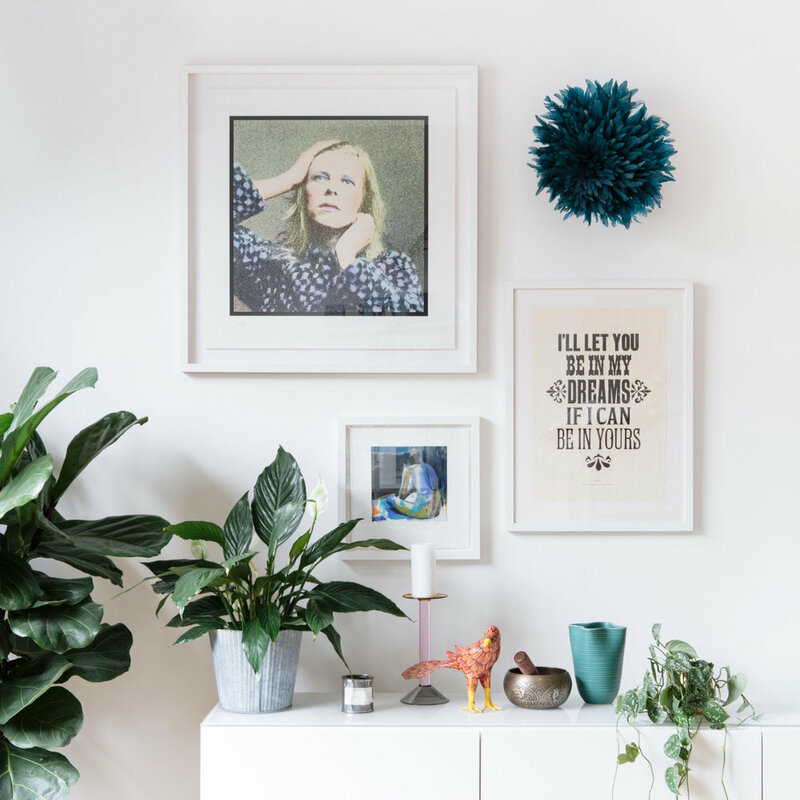 The hero piece in this gallery wall is a original screen print from the album cover Hunky Dory by David Bowie. We love the combination of texture and type on this wall. The African headdress was sourced in Swaziland, a place close to Jules, our Creative Founders heart. This Bowie beauty starts at £800. As our Creative Founder Jules always says "You wear your heart on your walls" this music corridor was created for a couple who love music. 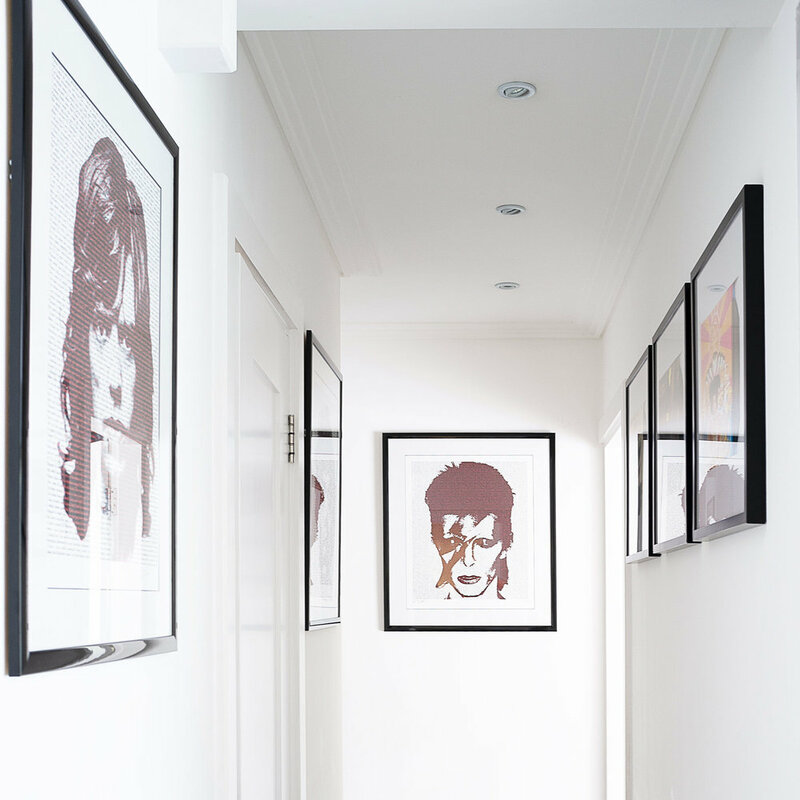 What better way to cheer your hallway by framing all your favourite album covers. To go alongside we commissioned limited edition giclee prints combining lyrics and portraits of famous musicians. If you'd like a music gallery wall or music inspired corridor we can work with you to create one you love. Prices start at £1000. "Jules prepared a full document of art and inspiration for me to consider for our home. Her idea for a ‘music corridor’ was inspired. She successfully brought together our love of music with the need for colour on an all-white wall. I couldn’t love it more!" Everyone needs street art in their lives. This wall was created for Tom who lives in North London. We commissioned the successful artist Will Barras to take centre stage. Around "Surround Sound" is a selection of prints from East London galleries. There is also a second commissioned piece by artist Stef Platez and the vinyl was a real hit. If you would like a hip street art inspired wall, prices start at £5000 using original pieces of art or £1500 using limited edition prints. "It has been exciting and fun to collaborate with Jules and her artists to commission a dynamic and energising gallery of original works and prints for my teenage son. It has been a fantastic way to kick start his collection and to introduce him to the joys or art appreciation."